Latin America’s growth may have slowed in recent years in the wake of low global mineral prices, but Latin Lawyer’s second associate salary survey reveals that most firms across the region are continuing to offer their young talent above-inflation rises and generous bonuses to keep them within the fold. However, our results also reveal broad variation in the generosity of these pay packets; both between firms in different jurisdictions and within the same market too. Non-monetary benefits, such as further education, training and work-life balance, are other important features of the average, millennial pay packet. In Mexico, we report from Latin Lawyer’s 8th Annual Oil & Gas conference on the potential benefits for the industry since President Donald Trump’s election victory in the US. We also gathered managing partners of the country’s leading firms to discuss the impact of the Mexican government’s raft of far-reaching legislative reforms on the legal market. Elsewhere, Lifetime Achievement Award winner and Machado Meyer Advogados founding partner Antonio Meyer reflects on his rise to the top of Brazil’s legal profession since embarking on a career on a whim as a young student; we report from a half-day conference in New York organised by a group of in-house counsel on efforts to boost diversity in the legal profession; and we learn why the absence of updated antitrust legislation in Argentina is holding back the country’s competition authority. 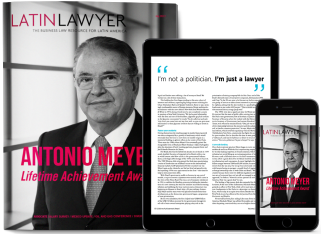 Machado Meyer Advogados founding partner Antonio Meyer, winner of Latin Lawyer's 2017 Lifetime Achievement Award, talks to Vincent Manancourt about choosing his career on a whim, steering billion-dollar mergers and acting as a therapist for his clients. "Poor Mexico," 19th century Mexican general Porfirio Díaz once lamented, "so far from god and so close to the United States." Yet Mexico's proximity to its northern neighbour is a good thing for its oil and gas sector, even with Donald Trump in the Oval Office. Here, Latin Lawyer reviews what panellists at Latin Lawyer's 8th Annual Oil & Gas conference had to say about Latin America's energy prospects and why President Donald Trump's fossil-fuelled policy of America First may benefit Mexico. Until Argentina passes new antitrust legislation to improve its outdated regulatory framework, the competition authority has a handicap akin to playing a match minus a star player, says Pablo Trevisan, a commissioner at Argentina's National Commission for the Defence of Competition (CNDC).